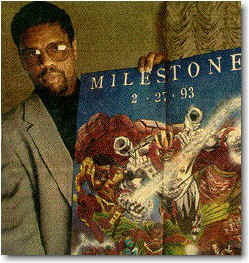 The Newest Rant: Very Sad News--Dwayne McDuffie Has Died. I learned today at dinner when I check for the newest comic news on my phone that Dwanye McDuffie has died. I really enjoyed his work and he was even one of the few comic creators I ever wrote to--with my expressing support for him back when he was having conflicts with DC comics over the Justice League Title. Apparently he died of complications from surgery. I have some links about how he was a great writer, and how he worked to fight against racial stereotypes in comics and have more people of color both involved in the creation of, and represented in comics. Comics Alliance 1st post, and 2nd post. My heart goes out to his family and friends, along with everyone who was ever touched by his work.